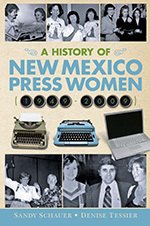 New Mexico Press Women is an organization of professional journalists and communicators that promotes the highest ethical standards while looking to the future in professional development, networking and protecting First Amendment rights. If you would like to help New Mexico Press Women with a donation toward accomplishing its missions, click on the “Donate” button. Thank you! NMPW is a 501(c)(6) corporation. Donations to NMPW are not tax deductible for donors.